Until now we have been focusing on adding new functionalities to our application (HTTPS and centralized logs). However, in doing so we have slowed down substantially our CI/CD pipeline, as it now takes about one hour to complete the full process. The goal of this tutorial part is to focus on this slow pipeline problem and to find ways to accelerate it. Note You can find the source code containing the modifications described in this part in the folders sample-app/version6 and deployment-toolbox/version1. The slowest stage of our pipeline is the one responsible for deployment, and its first task is to download and install tools. It usually takes several minutes to complete and unnecessarily wastes resources such as network bandwidth. A way to speed up this first task is to create our own Docker image, and then use it in our pipeline. Log on to the Container Registry console. If necessary, select your region on top of the page. Click Namespace from the left-side navigation pane. In the popup form, set a field value corresponding to your domain name such as my-sample-domain-xyz (replace dots . by dashes -) and click Confirm. Note that we use the domain name because namespaces must be unique among all accounts in Alibaba Cloud. Click Repositories from the left-side navigation pane. Select Local Repository and click Create Repository. Copy the URL next to RAM User Logon Link. We will use it later. In the pop-up window form set sample-app-gitlab in the User Name field and click OK. The page should refresh itself and display our sample-app-gitlab user. Click Authorize on the right. In the new pop-up window, select the policy name AliyunContainerRegistryFullAccess and click the button with an arrow pointing to the right. Click Manage on the right of the user sample-app-gitlab. In the pop-up form, enter twice the same password, uncheck the checkbox On your next logon you must reset the password, and click OK.
Open a private web browser window and browse to the RAM User Logon Link URL you copied earlier (it should be something like http://signin-intl.aliyun.com/5939306421830******/login.htm). Login with your ram username and password (the username should be something like sample-app-gitlab@5939306421******. The password is the one you set earlier. Click Reset Docker Login Password. Close your private web browser window. Log on to the Container Registry console (with your normal account). Click the first address (next to Internet) to copy it (it should be like registry-intl.ap-southeast-1.aliyuncs.com/my-sample-domain-xyz/deployment-toolbox). This command should prompt for the password you set earlier when you clicked Reset Docker Login Password. If the configuration is good, the command should print Login Succeeded. The --username argument should be sample-app-gitlab@your-user-id-or-enterprise-alias. You can find your user ID or enterprise alias inside the RAM User Logon Link you copied earlier (for example, if the link is http://signin-intl.aliyun.com/593930642183****/login.htm, then the user ID is 593930642183****). The next argument is the domain name of your repository address (for example, if the repository address is registry-intl.ap-southeast-1.aliyuncs.com/my-sample-domain-xyz/deployment-toolbox, then the argument is registry-intl.ap-southeast-1.aliyuncs.com). In the home page, click New project. In the new page, copy the URL for git (such asgit@gitlab.my-sample-domain.xyz:marcplouhinec/deployment-toolbox.git). docker build -t deployment-toolbox:latest . - docker build --cache-from $IMAGE_URL:latest --tag $IMAGE_URL:$CI_PIPELINE_IID --tag $IMAGE_URL:latest . Save and quit with CTRL + X. Open your web browser tab with GitLab. The deployment-toolbox project should be displayed. REGISTRY_USERNAME = the username you already used in the previous section when you have tested your configuration with docker login. REGISTRY_PASSWORD = the password is the one you set when you clicked Reset Docker Login Password. REGISTRY_URL = the domain name of your repository address. IMAGE_URL = your repository address. git commit -m "Create the Dockerfile." Check your CI/CD pipeline (for the deployment-toolbox project) and make sure there is no error. Click Manage next to the deployment-toolbox repository. Click Tags from the left-side navigation pane. Remove TERRAFORM_VERSION: 0.11.11 and PACKER_VERSION: 1.3.3 from the variables block. 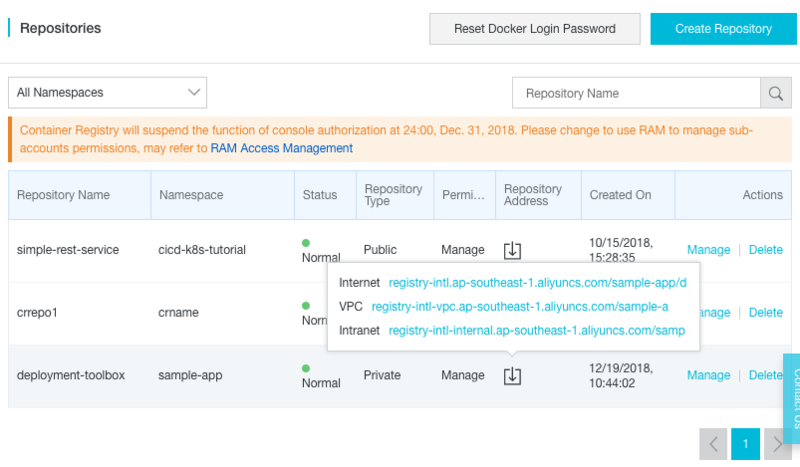 In the deploy block, replace the ubuntu:18.04 image by your image; it should be something like registry-intl.ap-southeast-1.aliyuncs.com/my-sample-domain-xyz/deployment-toolbox:latest. In the deploy block, remove the two scripts - ./gitlab-ci-scripts/deploy/install_tools.sh and - ./gitlab-ci-scripts/deploy/install_python_packages.sh. Switch to the todolist project. The URL registry-intl.ap-southeast-1.aliyuncs.com must be adapted to your registry domain name. git commit -m "Replace the Ubuntu image by our deployment-toolbox." Check your CI/CD pipeline on GitLab, the deploy stage should be slightly faster. - "python3 ./gitlab-ci-scripts/deploy/update_logtail_config.py $ALICLOUD_ACCESS_KEY $ALICLOUD_SECRET_KEY $ALICLOUD_REGION $ENV_NAME"
As you can see the deploy_apps stage has 2 jobs: deploy_webapp and deploy_certman. We did not change the scripts, just execute them in parallel. Save the modifications and quit with CTRL + X.
Click Instance from the left-side navigation pane. Select your region if necessary. Search for your instance named devops-simple-app-gitlab-runner. Click Connect on the right side of your instance. The VNC console should appear. Authenticate yourself with the root user and the password you set when you configured GitLab. Quit the VNC session by entering the command exit and by closing the web browser tab. git commit -m "Parallelize deployment." As usual, you can now merge the master branch to pre-production, and then pre-production to production.